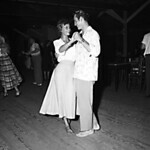 The Shag is of much more recent origin, being a type of swing dance that developed in the 1930's and 40's. Shagging, combining nimble footwork with upbeat rhythm and blues (known as Beach music) originated at open air beach parties on the North and South Carolina coasts, and is also the official dance for the State of South Carolina. For more information, see Shag Dancing. Oh found it and I LOVED the video so, so, so, so, so, so, so, so, so, so, so MUCH!!!!!!!!!!!!!!!!!!!!!!!!!!!!!!!! How can you see the video???? How can you see the video????? i did NOT get to see the video!!!!!!!!!!!!!!!!!!!!! do you need a link or something? I cant seem to find it either! We like it too! Please visit NCpedia again.